The world recognizes The University of Texas at El Paso among the foremost promoters of positive deviance, a simple, yet revolutionary model for social and organizational change, and that is due mainly to the ambassadorship of one man. Arvind Singhal, Ph.D., UTEP’s Samuel Shirley and Edna Holt Marston Endowed Professor of Communication, learned about positive deviance (PD) by chance while at a 2004 conference in Durham, New Hampshire. At the time, Singhal was a full professor at Ohio University in Athens, Ohio, whose research specialty focused on the diffusion of innovations and entertainment-education. Singhal said the PD concept shook him to his academic core because it flipped the familiar problem-based method in favor of an assets-based approach. It derives solutions from finding out what works among those for whom it should not be working. For instance, if you have a community where most residents are malnourished with a few who are better off under the same circumstances, you find out what the better-fed residents are doing and design a program that amplifies those actions with the rest of the community. In 2007, Singhal joined UTEP where he built a PD program. 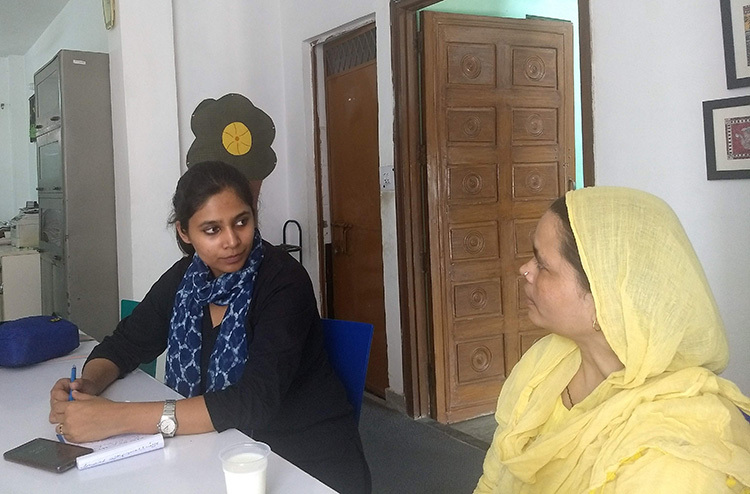 The native of Delhi, India, initially offered a PD module as part of a course, recruiting students into global and local PD research. He has written three books and more than two dozen case studies and peer-reviewed pieces on the topic. Since 2009, he has offered the country’s only full semester PD course. Add to that a full calendar as a guest lecturer or speaker at institutions of higher education throughout the world and side visits to share his PD knowledge with Fortune 500 companies and one can imagine the ripple effect. Because of Singhal and his global contacts, UTEP has a reputation as a leader in codifying, disseminating and carrying out PD research, and training graduate and undergraduate students in PD. Through his courses, workshops, collaborative research and conference presentations, Singhal empowers communities throughout the world to overcome their health, education and nutrition problems and to positively deal with issues such as child marriage, human rights, poverty alleviation, HIV/AIDS, sustainable development, civic participation, democracy and governance, and infant and maternal mortality. A few of his collaborators shared their PD experiences, which involved such topics as disabilities, self-confidence, family planning and emotional healing. Students who attended a preparatory vocational training school in Rotterdam, Netherlands, benefitted from a positive deviance program that built their resilience and self-esteem. Photo: Center for Media and Health. Martine Bouman, Ph.D., scientific director and founder of the Center for Media and Health (CMH) in the Netherlands, and Sarah Lubjuhn Ph.D., said they worked with Singhal to use PD to help immigrant children with their resilience and self-esteem. CMH funded the research through UTEP with Singhal as the principal co-investigator. This was the first PD project in the Netherlands. Bouman said the project’s goal was to enhance psychological resilience among students from lower socio-economic backgrounds and minority immigrant groups who attend the city of Rotterdam’s preparatory vocational training schools. She wondered how the students could better handle the stresses and anxieties that are a normal part of their lives. Researchers found that small practices had a positive ripple effect on parental and student engagement with the school. For example, teachers called parents to compliment their children to affirm positive behavior, and a concierge welcomed students every morning to build familiarity and trust. The concierge encouraged the students to arrive to class on time and to enter the building in an orderly way. This daily contact allowed the concierge to notice when a student was out of sorts, and he or she would ask the student’s mentor or team lead to check on the student. Bouman’s team shared these small practices with educators throughout the system to enhance the lives of all involved. The program won a prestigious national award for its innovation in health communication. Yoko Kawamura, Ph.D., associate professor at the Shizuoka University of Art and Culture in Japan, said she met Singhal through a U.S. mentor and invited him to Japan in 2011 to discuss entertainment-education (EE) with health care specialists. The UTEP professor mentioned PD a few times in his presentation, which sparked her interest. In 2012, she again used grant money to invite Singhal to speak, but this time his focus would be PD. That year’s audience also included business leaders. After his third visit in 2013, Kawamura organized PD Japan, which now includes more than 100 individuals across the country’s major cities and universities. The educator and researcher, who translated one of Singhal’s EE books into Japanese, brought 12 of her country’s scholars to UTEP for a week in December 2014 to learn more about PD. She said every meeting with Singhal deepens and widens her appreciation of the concept and its ability to improve people’s lives globally. Poonam Muttreja, executive director of the Population Foundation of India (PFI), worked with Singhal on PD research to enhance a media intervention that reached an estimated 400 million people. 2013 as the foundation’s main behavior communication initiative for change. PFI based the popular television show on Singhal’s PD field research. The program looked for feedback for better family planning methods. The audience responded and the show’s writers incorporated the real-life case studies into the scripts. The PFI leader said the effort enhanced positive interpersonal communication, promoted healthy and positive social norms, and discouraged negative norms such as child marriage, son preference, domestic violence, gender inequality and lack of contraceptive use. Davi Kallman, a doctoral candidate who is finishing her studies at Washington State University, said one of the first things she learned through positive deviance was the importance and the ease with which people can flip a script to change how they see the world and the people in it. Kallman, who has a learning disability, earned her bachelor’s and master’s degrees at UTEP in 2010 and 2012, respectively. She did her graduate thesis on PD and disabilities with Singhal as her adviser. She said PD shows how small communicative acts can make big differences, especially where there needs to be behavioral change, but the solution is not obvious. Because of her disability, she chose to study why some students with learning disabilities flourish academically while others do not. Kallman found that clear and consistent messaging were important. She said daily positive affirmations from students, parents, family members, friends, peers, teachers and mentors about the students’ ability to overcome obstacles, not to use their disability as a crutch, and to find ways to compensate for their disabilities made a difference. Such communication is often internal, repetitive and self-evaluated. This builds up the students’ courage to accept their disabilities and ask others for help. That often leads to success, said Kallman, a member of the Washington Governor’s Disability Task Force. Initial discussion of PD started in the 1960s, but it became better known because of the work done by the husband- and-wife team of Jerry and Monique Sternin, director and assistant director, respectively, with Save the Children, an international non-governmental organization that promotes children's rights and supports children in developing countries. The Vietnamese government gave the couple six months in 1990 to fix the child malnutrition problem in their rural communities. Because of the time limitations, the couple focused on four villages and asked why some village children appeared well fed compared with others. They did a lot of listening and learned that the mothers of better-fed children encouraged their children to eat; fed their children more, smaller meals; and added small shrimp, crab and sweet potato greens to their daily portions of rice. In this way, villagers helped discover these solutions with the Sternins, who shared this information with other families and then shared the same solutions with families in an additional 10 villages. Overall, the problem decreased by 65 percent to 85 percent during the next two years. That groundbreaking work served as a model that would help tens of thousands of children in 20 countries. The UTEP professor said PD is still an idea in its infancy among social scientists. He said that new concepts take time to mature and likened them to some of Albert Einstein’s theories that Newtonian physicists originally dismissed. “I see my mission to codify, write, teach and speak about positive deviance to create a stream of social science,” Singhal said. He has had a busy fall 2018 semester, which has included speaking engagements throughout the United States and visits to Canada and the United Kingdom to discuss PD. He said he is filling his spring calendar with similar requests. On occasion, the University will host a PD conference, but Singhal said it is more convenient for him to travel to spread the PD word. The UTEP professor said he plans to offer his popular cross-listed PD course in spring 2019. Both the graduate and the undergraduate PD courses attract a spectrum of UTEP majors, but mostly students from the colleges of Education, Liberal Arts and Business Administration. He even has occasional guests from the United States and beyond who work at the highest levels of government and in public health who want to sit in on a class. Among his recent students is Ana Rey, a junior multimedia journalism major, who took the PD course in spring 2018. Her intention was to learn how PD research works to make a change in her hometown of Juárez, Mexico. The first-generation college student said there was a shortage of young truck drivers in Juárez. She said that field needs younger drivers to carry on the trade. Her plan was to use a PD approach to find a solution. She admitted that her initial efforts fell short, but she plans to revise her strategy. She meets with Singhal occasionally to discuss her project. Singhal said that PD’s best days are still to come and that includes at UTEP. He said the University is in a position to take advantage of the PD network because of its student demographic and border location with the region’s health disparities.